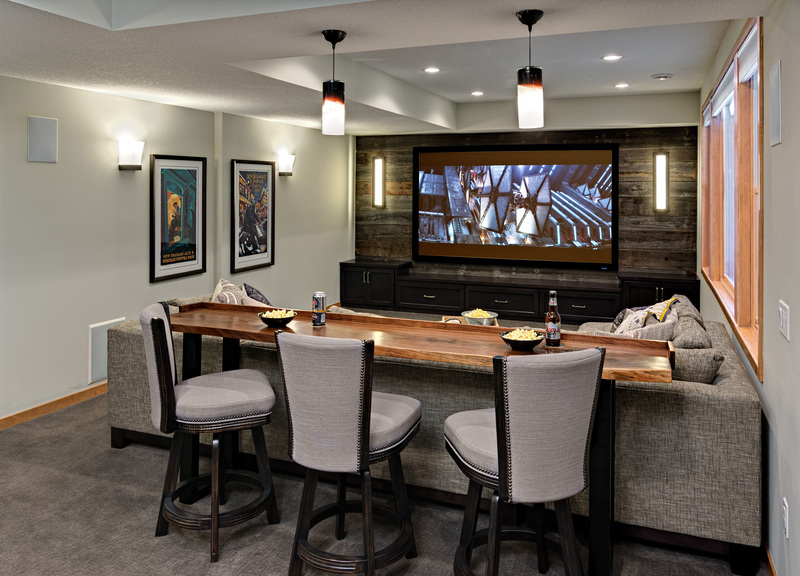 Knight Basement Lands 2017 CotY Award | Knight Construction Design Inc.
Minneapolis (Nov. 16, 2017) — Knight Construction Design tonight received the silver 2017 Minnesota Contractor of the Year (CotY) Award for the best Basement Remodeling in the under $100,000 category. The Chanhassen project was one of three entries. 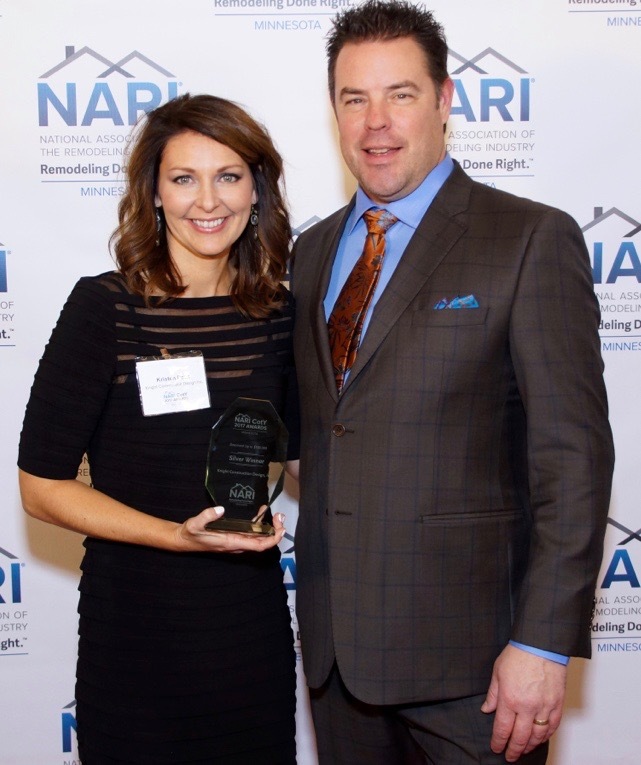 Knight Designer Kristen Peck accepted the crystal trophy at the National Association of the Remodeling Industry’s CotY Awards Gala. 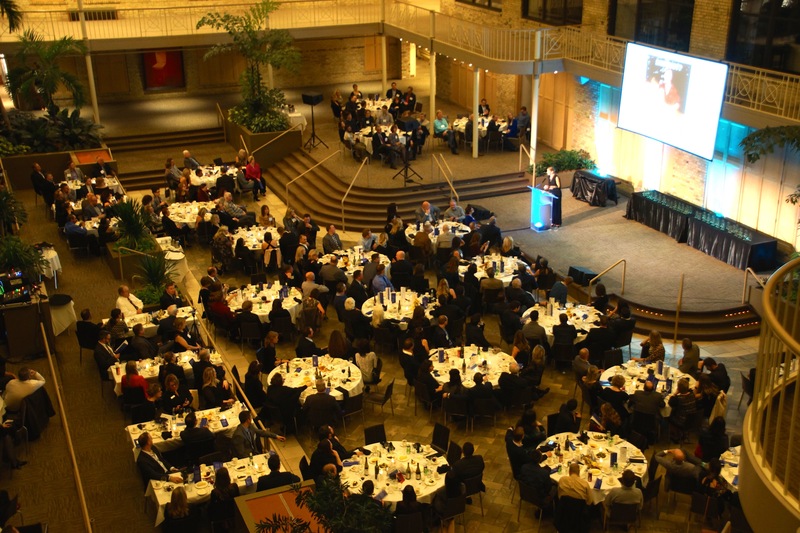 The annual event was held in International Market Square’s the 5-story atrium and attended by more than 300 NARI members and guests. 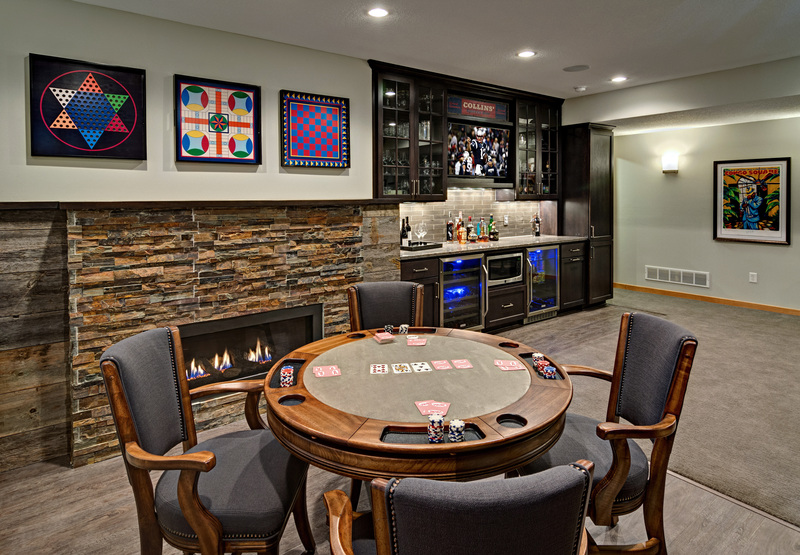 The young family had tasked Knight to convert a basic basement child zone into a “grown up” space where they could watch TV, play poker or just relax with a favorite beverage. The challenge was to incorporate a bar, an over 70-in. television and a new direct vent gas fireplace in the limited wall space while satisfying strict venting codes. With creative design, quality materials and innovative technology, the clients got everything they hoped for and more! The TV and the fireplace wouldn’t fit on the same wall in the home theater area, so Knight installed the fireplace in the game section near the new 6-ft. patio door. This location actually helped to heat the basement more efficiently in the absence of in-floor radiant heat. A tall, oversized stone surround bump-out enabled Knight to vent the fireplace the required distance from the opening and clear the concrete block knee wall. To enhance the design and add detail, Knight flanked the fireplace and around the projection screen with reclaimed barn wood. Rich, cherry custom cabinetry contrasts with the basement’s existing blonde wood trim. The bar features a quartz top and textured glass backsplash. The luxury vinyl tile flooring is a practical yet beautiful choice for the game and bar areas. A custom live-edge wood bar table separates the TV space from the bar area. Multiple types of fixtures and zones provide flexibility for both mood and task lighting. Recessed lighting is on three zones. Wall sconces, pendant lights and undercabinet lighting are on separate dimmer switches. CotY judges from NARI’s Milwaukee Chapter scored the project on a 15-point scale for six criteria: meeting clients’ needs, functional improvements, aesthetic enhancements, innovation, craftsmanship and degree of difficulty. It received an average score of 14 across the six areas.